Having recently begun streaming live to Twitch, our audience naturally asked us to play a live game of the cult-classic Twilight Imperium, a fantastically weird and wonderful space opera, where each player is vying for control of the galaxy. It’s a huge game in a huge box that often takes upwards of 12 hours to finish. Our love for the game saw us make a documentary about its history in 2018 - the next step was to do it justice as a piece of live broadcast! When trying to work out what our setup for streaming would look like, it quickly became clear that I would need something easy to use, and consistently solid; a system that would allow me to relax in front of the rolling cameras, safe in the knowledge that nothing would go wrong. For this reason, we opted for Blackmagic’s ATEM Television Studio Pro 4K, an all in one switcher and control panel. It can automatically convert virtually any format you throw at it - allowing someone with almost no training to switch between a really wide range of video sources with transitions that match the quality of our usual, edited video work. The aesthetic quality is important to me, but honestly the main thing is how reliably it all works: once you take away the technical headaches, you can get on with being creative - in this case, it allows me to focus on pratting about on camera! 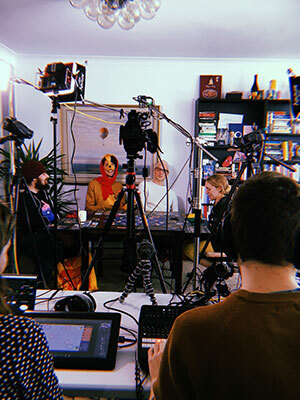 The other criteria we had to work with was that we didn’t have or want a fixed studio setting - instead, using my friend’s living room for each live stream - making it even more important to have a plug and play system that we could easily unpack and pack right away again. For cameras, we used three Blackmagic Micro Studio Camera 4Ks, a Canon C100, and a couple of Sony PXW-Z90 with SDI outs. They were positioned all around the living room to give us enough angles that we could flexibly switch between wide shots for political feuding and tight close-ups of the game’s bright miniatures when space battles inevitably occurred. We even had one Micro camera in a separate Big Brother style “diary room”. We ran SDI down the corridor to allow us to film from several different rooms at once - and an entirely separate space allowed us even more creativity: using a Reflecmedia green screen and harsh lighting gave us the option of using the switchers keyer - running a looping video of a galaxy behind those who popped into the room to share secrets and scheming. After just a couple of moments of tweaking, the ATEM’s keyer gave us a really nice clean key, live. We also had a pair of HyperDeck Studio Minis, one for playing out pre-recorded content such as the 2018 documentary Space Lions as a pre-show video to warm everyone up, and the looping green screen galaxy video that ran in the background throughout the day. A second was used to record a consistent-quality, clean version of the stream, which we could then upload to YouTube that wouldn’t be marred by any drops in stream bitrate. We also stripped away any of the messier overlays that only really felt relevant if you were watching us live on Twitch. In terms of overlays though, the ATEM desk’s media tools allowed us to hire a live illustrator who doodled and drew caricatures throughout the day. We then pinged these straight from Photoshop to the mixing desk and overlaid on the live feed when needed. This adaptive workflow also allowed us to pre-prepare some detailed assets to help viewers track the status of gameplay: again taking something that felt creatively impossible and allowing us to experiment with relative ease. The magical key at the heart of it all, though, is without a doubt, the Blackmagic Web Presenter. That little box massively takes the pressure off the streaming computer by converting all of the complexity of our live shows into something that is just treated as a single ‘webcam’, meaning we can stream the show from a laptop without worrying whether the CPU would be up to it. Honestly, after getting to grips with the workflow’s setup it’s pretty shocking to say that the only real technical hurdle that comes into play when aiming to stream and record for 10 hours is that human beings need breaks! The ATEM desk and stream are both rock-solid, and the dual SD card slots on the Hyperdeck Studio Mini means that recordings will automatically hot-swap between cards at the point at which one runs out. Recording in H264 to save ourselves from incredibly large files. Nine hours of gameplay constituted 150gb of material in all - perfect for chopping up for YouTube. The lines are blurring now between traditional TV and online video content, especially when it comes to production values. Viewers have come to expect exceptionally high quality, and this wouldn’t be possible for us to achieve without affordable, broadcast quality equipment from manufacturers such as Blackmagic Design.